Dired is a inbuilt File Manager for Emacs. Its arguably the best file manager with the functionality it possesses. Unlike any other file managers the directory listing is just as an another buffer of Emacs with dired-mode as Major Mode. Dired has countless functionality. The best way to learn it is to try it out. Open a dired buffer and look at the commands listed in the menus. ask for a directory and puts you into a buffer with direct listing of that directory. jump to a dired buffer corresponding to the current buffer (This require loading Dired Extra). jump to a dired buffer corresponding to the directory in the minibuffer. Open the file/Directory. You can use a to open the directory without creating another buffer. i: open directory in subtree. Use ^ to go up one level. With a prefix argument (C-u i), you can edit the ls switches used for the listing. So you can add R to expand the whole tree starting at this subdirectory. If you set (setq dired-dwim-target t), split your window and open another dired buffer on the other window, Dired will suggest it as the default target directory for the copy and rename commands. Wdired mode (writable dired) allows you to enter a mode where you can edit filenames, symbolic link target and filenames permissions as you would in a regular buffer. It is particularly great to do some editing based on search and replace. enter wdired mode (calls wdired-change-to-wdired-mode). Type C-c C-c to validate your changes or C-c ESC to abort. M-x customize-group RET wdired to customize wdired behavior. Note: in Dired, you can rename a single file or move the marked ones with R.
By default, typing s will toggle sorting by date. You can change the listing switches (of GNU ls) with C-u s.
will display directories first. You can then customize per-directory local variables. Dired+ (see below) offers more options (sort by size, by extension,…) and will add a menu entry. With M-x find-name-dired, you'll be asked for the base directory, a file wildcard and the matching files will be displayed in a Dired buffer. It uses the find GNU utility. Similar commands are find-grep-dired or find-dired. More information can be read in the documentation. Projectile, coupled with M-x helm-projectile, lets you find recursively and interactively files in your project. This command does not use a Dired buffer. Viewing images is a builtin feature of Dired (press Enter or v on an image file). On Emacs24.4, pressing n and p will show the next or previous image file. But if you want to navigate between image thumbnails, use the (builtin too) image-dired. You can directly call it with M-x image-dired, or mark the images you want to look at in the dired buffer (with m) and then type C-t d (image-dired-display-thumbs). More advanced features include image tags, which are metadata used to categorize image files. The tags are stored in a plain text file configured by image-dired-db-file. To tag image files, mark them in the dired buffer and type C-t t (image-dired-tag-files). This reads the tag name in the minibuffer. To mark files having a certain tag, type C-t f (image-dired-mark-tagged-files). After marking image files with a certain tag, you can use C-t d to view them. You can also tag a file directly from the thumbnail buffer by typing t t and you can remove a tag by typing t r.
There is also a special “tag” called “comment” for each file (it is not a tag in the exact same sense as the other tags, it is handled slightly different). That is used to enter a comment or description about the image. You comment a file from the thumbnail buffer by typing c. You will be prompted for a comment. Type C-t c to add a comment from Dired (image-dired-dired-comment-files). Image-Dired also provides simple image manipulation. In the thumbnail buffer, type L to rotate the original image 90 degrees anti clockwise, and R to rotate it 90 degrees clockwise. This rotation is lossless, and uses an external utility called JpegTRAN. Dired-du (in GNU ELPA) defines a minor mode dired-du-mode to show the recursive size of directories in Dired buffers. If the du program is available, then the directory sizes are obtained with it. Otherwise, the directory sizes are obtained with Lisp. The former is faster and provide a more precise value. For directories where the user doesn't have read permission, the recursive size is not obtained. Once this mode is enabled, every new Dired buffer displays recursive dir sizes. but beware that it can take a long time. So you can also enable this mode once in a buffer: M-x dired-du-mode, and disable it when you're done. You can also select files (with the selector * for example) and call M-x dired-du-count-sizes, to count the number of marked files and how much space they use. Many times, you want to open media files, pdfs or other documents with an external application. There's remedy for that too, namely dired-guess-shell-alist-user, but that is still not as convenient as just hitting enter. dired-open is part of dired-hacks (in MELPA). This feature is also the goal of openwith (in MELPA). see Treemacs. It has optional git integration (showing the status of files with different faces), optional follow-mode, projectile integration (quickly open treemacs at any known project’s root directory), session persistence with desktop-save-mode, and more. 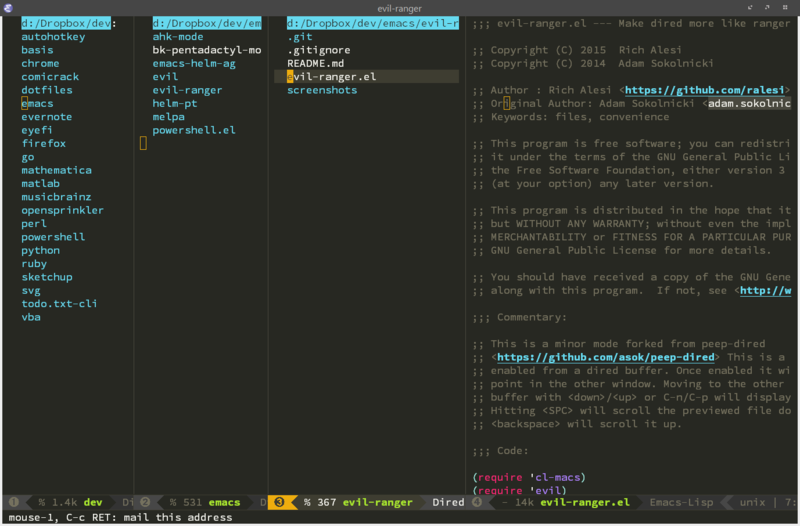 Ranger is a file browser for the terminal that has a nice navigation system composed of three panes: the current directory at the middle, the previous one to the left, and a preview of the file the cursor is on to the right. Peep-dired mimics a handy two-panes navigation with instant preview. With ranger (formerly known as evil-ranger, even if it wasn't specific to evil-mode), we have most of ranger's functionalities in Dired: 3 panes layout, previews, etc. Very nice ! This page was last edited on 27 September 2017, at 12:46.